I crawled into bed a couple hours before my alarm was due to ring, but I was too anxious to sleep. The ski day ahead of me only briefly concerned me with the usual fear of having forgotten to pack some crucial piece of gear. After several months of funenploymed ski bummery, for once, I was being kept up at night by work related anxiety. I had to decide my future home as a wildfire fighter. Lose 5lbs that I can’t spare and enjoy exciting long-line helivac training opportunities in Salmon Arm, or eat normally and move to the little mountain town of Lillooet to join a regular initial attack crew? I was torn. I gave up pretending to sleep at 11:30PM, made myself a couple of big cups of strong tea, ate some toast, and tried to convince my body that this was breakfast. Christian Veenstra rolled up at 12:30AM and we on drove past Squamish, on what would be my first visit to the Tantalus Range. By nature of traverses we would end in a different place than we started. We stashed Christian’s bike beside the Squamish Valley Road near our planned exit, and continued up to the Sigurd Creek trailhead. We left the car, at about 100m above sea level, at 3AM. With skis on our packs we sprinted up the trail, Christian leading while I panted behind, trying to keep up. We stepped onto our skis as light gathered on the eastern horizon, and made our way up the flank of Pelion as the sun rose. We crested the ridge just north of the summit of Pelion, around 7:30AM, having already climbed 2200m, and traversed its sunny eastern aspect as quickly we could. 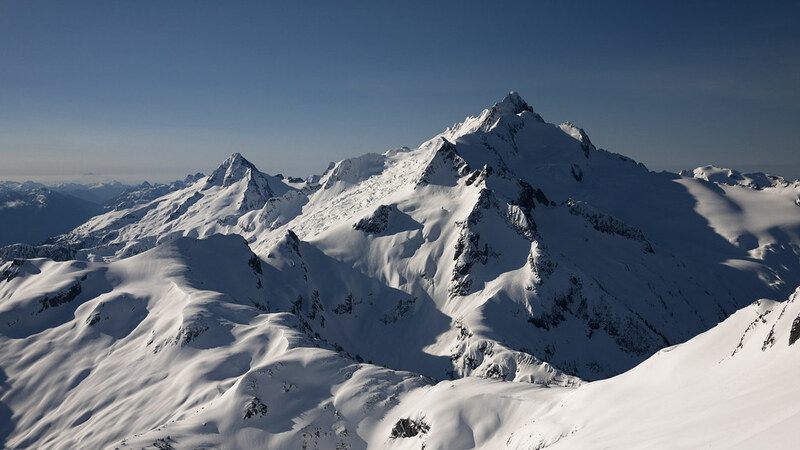 Within a few hours, the sun would render the snowpack on that slope dangerous. A door closed behind us. Bootpacking an especially icy section on Pelion. Now in business hours, we stopped near the Pelion-Zenith col to dig down to an alpine pond for water, and for me to call the powers that be in BC wildfire fighting. I had finally made my decision. Losing 5lbs and keeping that weight off, as a broad-shouldered 6’2″ young guy, would be miserable. I told the folks in Salmon Arm as much, and closed that door. It would be Lillooet then, I hoped, or elsewhere in the Thompson-Okanagan. 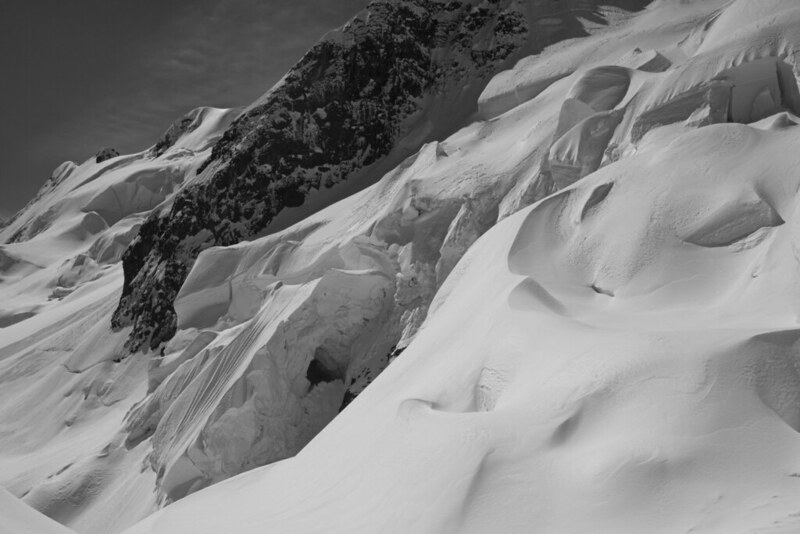 As far as the Zenith-Tantalus col, we traveled mostly on a firm crust, making good use of our ski crampons. But, as we gained elevation, moving onto the aptly named Rumbling Glacier, we discovered that the previous week’s snow hadn’t yet melted to form a crust higher up. Our progress slowed as we traversed across the east-facing glacier and soon the fresh snow was melting in the morning sun. By 10AM, the snow had transformed into a heavy adhesive that glopped to our bindings, top-sheets and skins. This was the heaviest, stickiest snow Christian or I had ever experienced. 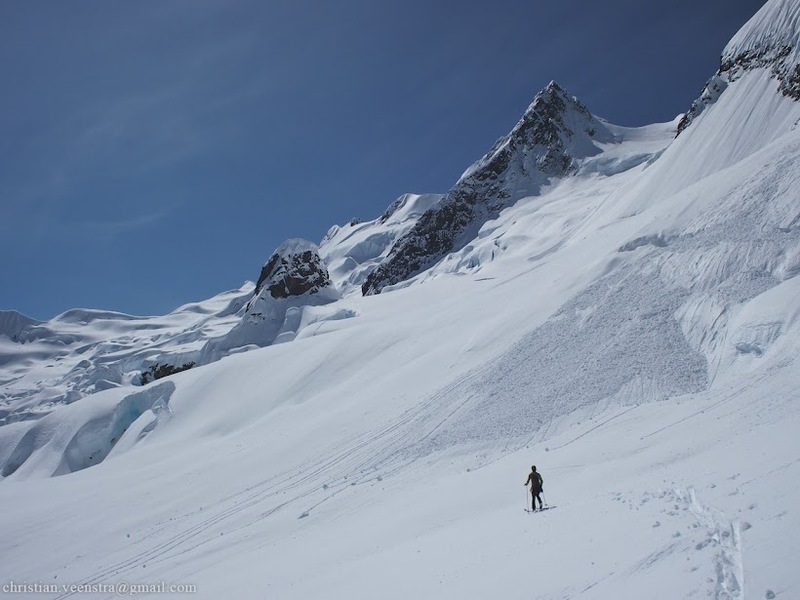 The weight of the snow stuck to our feet made it obvious why in a sport dominated by slack-country skiers using alpine boots, Marker Dukes, and 5kg skis, no one had ever tried to do the Tantalus Traverse in a day. With 3500 metres of elevation gain over 40 kilometres and some of the most complex terrain around, I had doubts of whether we could pull it off as we made painstaking progress up the Rumbling Glacier. Death by glop on the Rumbling Glacier. 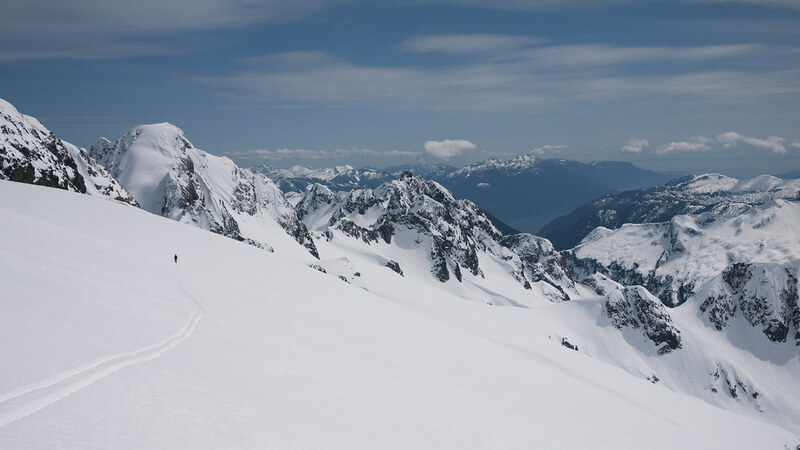 The idea of doing the Tantalus Traverse in a day came as the logical culmination of an exciting ski season. Having switched onto alpine touring gear from a few years of telemark, I rediscovered that I was a good alpine skier. I equipped myself with lightweight touring gear, and I’ve continued to surprise myself with what I can now accomplish on skis. 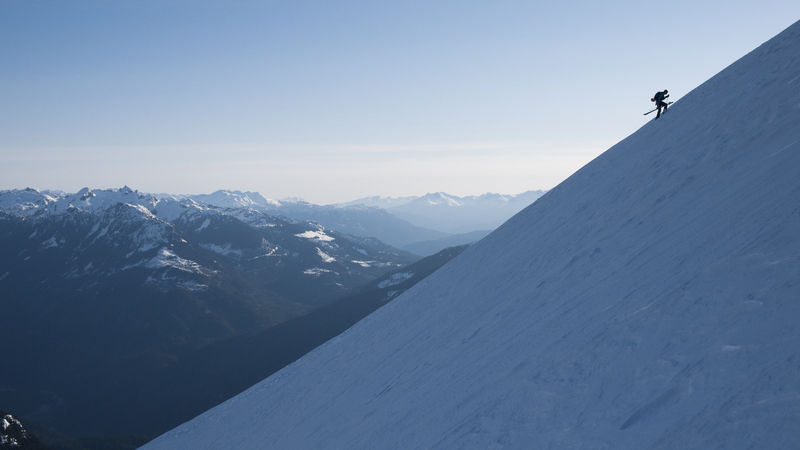 Earlier this season, I did the Garibaldi Neve in a day in a leisurely 10 hours. No really, it was leisurely. We wasted a lot of time and I felt like I had lots left in the tank at the end of the day. Then, a few weeks later, Christian did the Garibaldi Neve traverse in 5 hours 38 minutes, stopping for 45 minutes a Ring Creek to try to find a water source. Afterward he discovered that this was only six minutes slower than the fastest known time. Since then (breaking news), Nick Elson has completed the neve in 4:27. I was inspired. 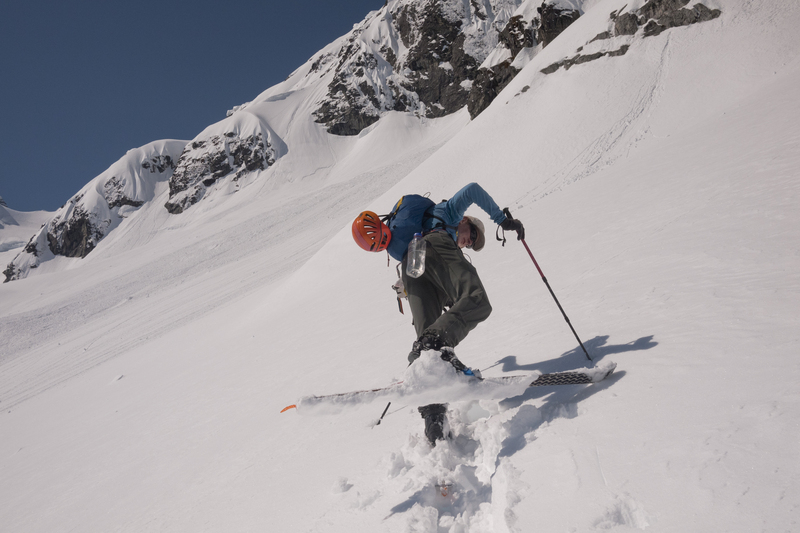 Sure, I’m a long ways off from breaking skimo records, but I knew I could keep up to Christian better than most and I want to test the limits of how far and how high I can ski. Christian suggested we do the Tantalus Traverse in a day. We gained a subtle, less crevassed bench on the Rumbling Glacier, directly below the steep upper faces of Mt Tantalus and Dione. The debris fans below the face indicated that avalanches were not running so far as to pose a constant threat while traversing north to south on the upper edge of the icefall. We were nevertheless forced to cross a few fresh slide paths along the way. Moving across one debris path, I looked up to see a slide rushing toward us. I yelled out and Christian and I were able to turn around and ski back into the shelter of a nearby rock buttress as the avalanche swept our tracks of moments before. Fortunately wet slides move slowly enough to make such maneuvers possible. Scared, we thought about waiting for nightfall and freezing temps, and we thought about bailing. But the afternoon would only get warmer, the forecast promised warm nights, and the slide was small. Our only clear bail option would be to call a helicopter. We accepted the best way out was forward. Crossing the Rumbling Glacier – Christian Veenstra photo. Crossing above above a nunatak, then literally sprinting below a fierce cracked serac cave, we made our way along another bench between crevasses until we reached a notch on the south shoulder of Dione. This was our high point. Still 14km from the Squamish River crossing, we wouldn’t use skins again. Brutalized from the heavy snow on the Rumbling Glacier and the 3400m of elevation gain under our belts, both of us were already running on emergency power. A few steep turns brought us onto a long downward traverse past the Jim Halbern hut and Serratus beyond. The stickiness of the snow allowed us to climb up a short ways to the Serratus-Ionia col, from where we continued contouring around Serratus until we could drop down a gully into the Russian Bivouac. We headed for the col just right of Serratus (on the left), past the Halbern Hut, in the col between us and Serratus. Down on Lake Lovelywater we were finally able to rehydrate. We glided across the lake without skins, expecting to soon be cruising down the trail. In reality, the Lake Lovelywater trail was a surprise crux of the trip. The trail was at first hard to find, then involved steep, chunky ice skiing or technical downclimbing where a slip would put one of us into a terminal slot canyon or over a waterfall. And here, our crevasse and avalanche rescue gear would do us no good. This was more dangerous than crossing the Rumbling Glacier. We were glad when we could finally strap our skis to our packs and hike down the snow-free trail in a trance. On a better section of the Lake Lovelywater trail. We crossed the Squamish River, back to civilization, by using the tandem cables that support the hydrology cable car. The cart locked on the other side, we walked on the thick lower cable while holding onto the thin upper cable that holds the wire marking orbs. After over 17 hours on the move, and about 36 hours without sleep, I struggled along the cable. Shimmying, wobbling, and teetering along the line, my mind would wander and I’d look down at the river to watch it flow by. I’d start to take a rest from the core exertion before I remembered I couldn’t rest on the cable. A few slings and locking biners would prevent me from drowning in the river should I fall, but I didn’t feel like finding out whether I could get back on the cable if I let go. By some miracle, I made it across the river without falling off, even if by the time I had made it across, my sweat glands had become the main tributary of the Squamish River (to paraphrase a previous trip report). Christian somehow made it look easy. We were both on the correct side of the river, officially done the traverse after 17 hours and 27 minutes. 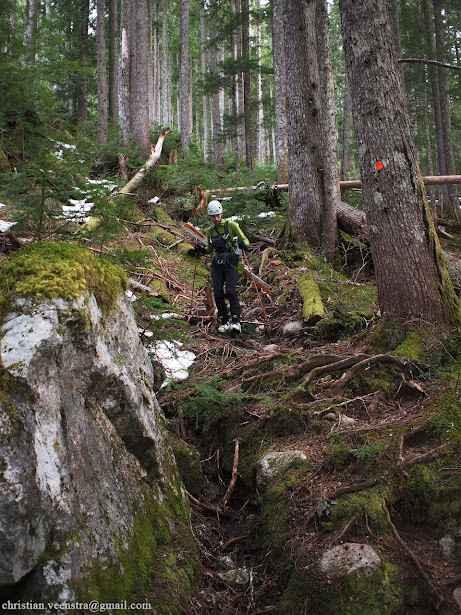 To our knowledge, this is the first time that the Tantalus Traverse has ever been done in a day. Back at the Squamish Valley road, Christian was the hero as he rode the bicycle for another hour to retrieve the car, while I sat on the side of the road. I couldn’t stay awake on the drive home. Eventually Christian also reached this stage of exhaustion, so we parked somewhere along the Sea to Sky highway for a nap. I crawled into my bed around 2:30AM and didn’t move for hours. Three weeks later, I find myself in Lillooet, in love with the geography around me and stoked to fight forest fires with my new friends. Great TR for an impressive trip! Rock on! Epic glob of death… wow. Good job on that. hey guys, how come I don’t see any skis on last picture? Did you just throw them into the river? 🙂 Good job with the traverse! Oh they’re there. They were both on the other side of his pack I think. Nice work on that Eureka couloir. Maybe you should contact Johnny Foon about that, (http://www.foonskis.com/category/johnnys-adventures/) He and Eric Pehota and Trevor Peterson bagged a lot of first descents in that area back in the day, he can probably confirm if it was a first descent. Awesome job either way! Booo for summer time now, maybe we’ll run into each other next season! Good for you guys, pics are dramatic ! 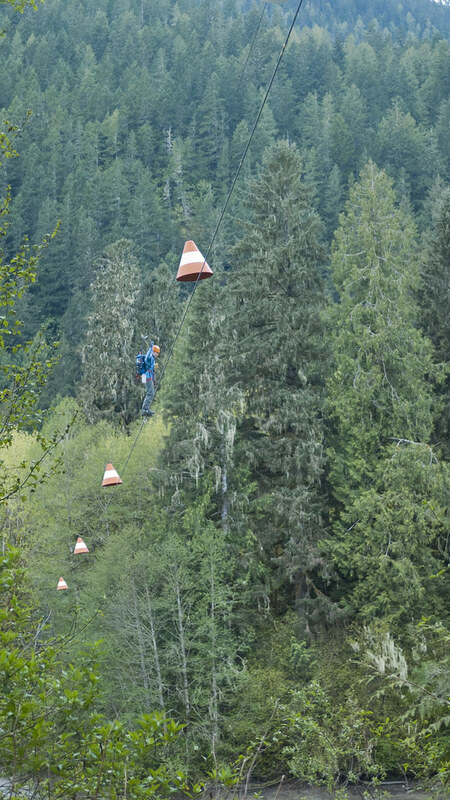 Pingback: Crossing Parallel 49 (South) | Run Out, Off Route. I am considering a trip to Greenland this summer and am interested in the Korridoren Glacier. I read a trip report, which you wrote about a trip you did there. (sorry if you are not this person…googled your name and this is what came up) sounded like you had a fantastic trip. I would love to pick your brain on some logistical questions. if I’ve got the correct person? you can email me if you’d like to share with me some information.